14th place doesn’t sound particularly bad, but having flirted with a Europa League place earlier this season, it represents an alarming drop in form in the second half of the season. Considering that the side directly below them – and only three points below them – is Blackburn Rovers, in serious danger of relegation going into the final day of the season, it’s remarkable that Coyle has escaped with so little criticism. Places between, say, 7th and 14th are often regarded as ‘midtable obscurity’, and there’s a perception that it doesn’t really matter where you finish within them. It does matter. It matters to supporters who want to see their side finish as high up as possible, it matters to players who may consider joining the club in the summer, and it matters in terms of finances. The difference between 7th and 14th is equal to £5.6m in prize money – a fair amount to a club like Bolton, who are unable to compete with big clubs (or even some of the smaller ones) in the transfer market as it is. Coyle does have an excuse for his side’s dip in performance. Because of the financial problems, the size of the squad is relatively small – and that has been coupled with bad luck on the injury front. Stuart Holden was ruled out for the remainder of the season back in March, and considering he was considered the best player in the Premier League by the Guardian’s fans network at the turn of the year, it’s been a huge loss. Coyle had to use veteran left winger Ricardo Gardner and departing striker Johan Elmander as his central midfield duo in the final game of the season, which sums up how bad the situation became. The more confusing aspect of Bolton’s performance this season has been the constant praise for their style of football. A couple of very good team goals in the early part of the campaign made this praise somewhat justifiable. It did sometimes reach slightly bizarre levels, though – Mark Davies is a talented player, but he is not ‘the English Iniesta‘ and nor is he likely to ever reach anywhere near that status. It should be said that a team is entitled to play as attractive or unattractive brand of football as they like. 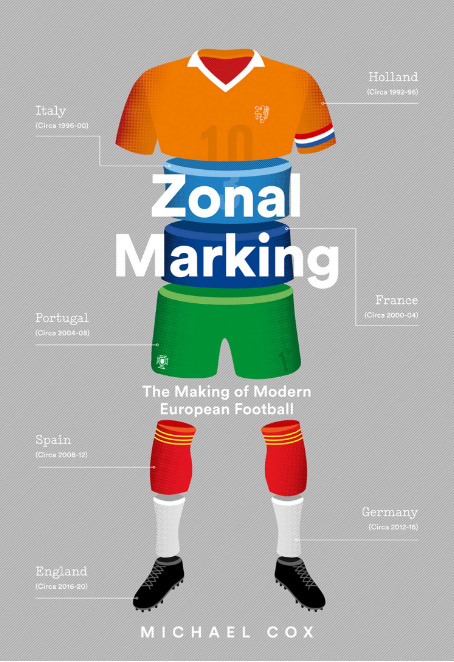 ZM is concerned with tactics rather than aesthetics – Greece was named the best side of the last decade, for example. And ‘attractive’ is, of course, highly questionable. However, it’s generally considered to involve short passing football, an emphasis upon keeping the ball on the floor, and a focus upon technique over physicality. Again, you can argue what constitutes ‘entertainment’ – but the emphasis is clear. “A certain type of football” is not being used in a complimentary way. Gartside wants his side to play more progressive, intricate football. Possession would generally be high for a side playing ‘entertaining’ football. Barcelona are regarded as the chief entertainers in Europe, and their average possession this season was 73.4%, which is 11.9% higher than any other club in Europe’s top five leagues. Similarly, Arsenal – often regarded as the side playing the ‘best football’ in England, topped the chart in the Premier League with 60%. It’s something of a surprise to see Bolton so low down – fourth from bottom, averaging just 46% of possession. Only long ball merchants Stoke and Blackburn (under Sam Allardyce), plus bottom club West Ham, are below. Even Birmingham, who managed less than a goal a game this campaign, see more of the ball. But possession is only one factor. Knock up a scattergraph comparing possession and pass completion rate, and you’ll probably find a pretty good correlation. Again, the likes of Barcelona and Arsenal are up there in the 80 and 90%s. A decent side should be aiming for around 75%. That’s probably near enough where you expect Bolton to be. In fact, they’re much lower. They’re third from bottom here, again with Stoke and Blackburn. In fact, there’s a clear group of three at the bottom. Nowhere along the line is there a gap of more than 2% between sides, and then there’s a 5% gap between 17th-placed Sunderland, and 18th-placed Bolton. An ‘attractive’ side would generally be expected to keep the ball on the floor. Arsenal are at the top of this graph, but again – Bolton are in the bottom three, along with our old friends Blackburn and Stoke. 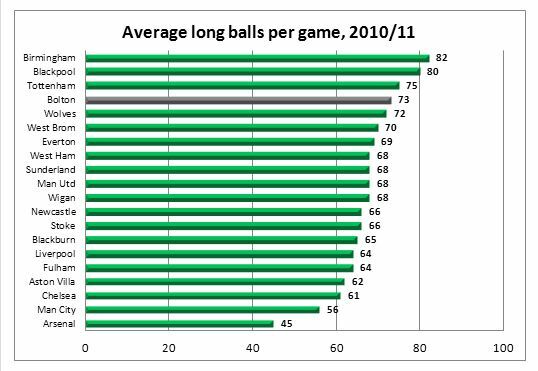 Arsenal are again at one extreme – the least long balls per match – and Bolton are towards the other end. There’s a few different names around them this time – Blackpool and Tottenham included – and since those two are generally considered to play ‘good’ football, this is maybe less of a telling statistic. 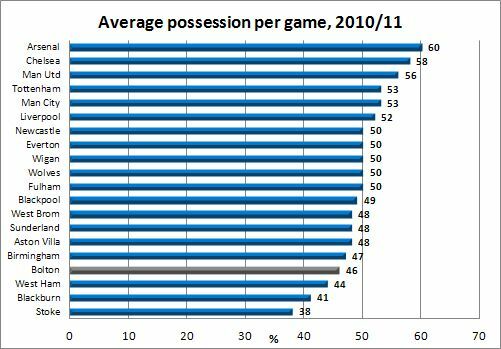 Stoke and Blackburn are lower down the list, presumably because they don’t enjoy enough possession to hit the ball long frequently. Still, it shows that Bolton are keen to hit the ball long. Bolton are in a class of their own here – 25 tackles per game. That’s far from a bad thing, of course – regardless of how ‘attractive’ a side is, their manager isn’t going to encourage them to try to win the ball back less. Still, it points to the fact that the team is still based around physicality – certainly more than it is based around short passing, anyway. Again, this is a positive. 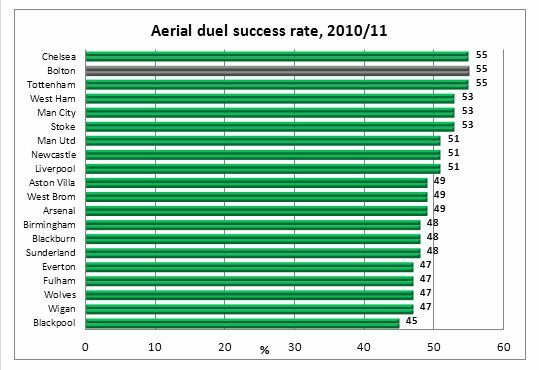 Even Barcelona would want a 100% aerial duel success rate, and with a good list of centre-backs to choose from, plus Kevin Davies and Johan Elmander upfront, Bolton are fearsome in the air. But it must be emphasized that this is still what Bolton are best at. Not always the best way to judge attractiveness – Barcelona and Arsenal commit a fair number of fouls because they play high up the pitch, and try to stop opponents countering with tactical fouls. Still, Bolton are again at the top – no side commits more fouls in the Premier League, which is not generally considered a typical attribute of a good footballing side. A similar measure here – how many cards each side have picked up. Bolton again have one of the worst records, though it’s worth considering Arsenal’s similar position. If you consider attractiveness to be about keeping the ball short and placing technique over physicality, then Bolton do not play particularly attractive football. On these measures of attractiveness – which differ in usefulness, as outlined throughout the article – Bolton are in the ‘bottom four’ every time. 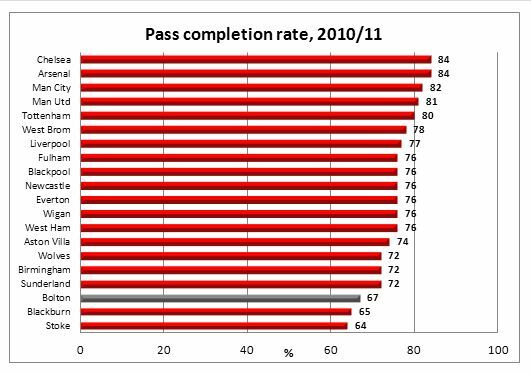 The pass completion rate is particularly damning. Have Bolton really evolved since Allardyce? In terms of aesthetics, it seems not, and in terms of results, Allardyce’s final four league finishes were 8th, 6th, 8th and 7th. 14th looks poor in comparison. These are all raw statistics. The true level of attractiveness can only be considered by an individual when viewing the side, and the fact that Bolton supporters appear happy with the quality of football is far more important than any graph. Still, these figures only support ideas put forward elsewhere (here and here) – Bolton are still predominantly a physical side, rather than a technically proficient one. The general thrust of the above argument was put to Coyle by FourFourTwo magazine – he disagreed with the viewpoint. They still play attacking and entertaining football, a 4-4-2 with two wingers and two genuine strikers. I haven’t seen them as a ‘technically proficient’ team at all, and haven’t really heard many calling them that, just that Coyle has got them playing some good football. They like to attack, rather than setting out defensively and not looking to concede. Holden was obviously a big loss, they need Muamba and Holden in their two man midfield not to get over ran. Also Lee was at the Asia Cup and didn’t seem to play as much in the second half of the season. Have you checked out the last of the links provided by ZM? The Guardian, BBC, Daily Mirror… I guess one can find out more! Especially mentioning “Arsenal blueprint” seems ridiculous in the light of the statistics. Same team Megson left behind. A team designed to kick. All these stats say to me is that Coyle is a smart man. He can’t switch styles over night, adaptation takes time and the right personnel. Last season there were few people out of contract, not a penny to spend and nothing coming from the youth system. This year a lot of players appear to be on their way out, so we can really start to see what Coyle is all about. Biggest myth in football. Ever. Varfelona might very well be the best entertainers in Europe, but only because of their players’ brilliant acting skills. Incredibly high possession does not equal entertaining football. Quite the opposite. Possession-obsessed sides like Varfelona are the death of high-paced exciting football as we know it. It takes absolutely no skill to flood your own half with 9 players and pass across 5-yards until the opposition gets bored. Want entertainment? Watch an EPL derby. Well, that’s your opinion. As I stated in the piece – “attractive football is, of course, highly questionable” – and also loosely define what is broadly considered to be attractive football. Obviously that won’t please everyone, but with your use of ‘biggest myth’ even you acknowledge that there’s a general feeling in that respect. Your use of “Varfelona” is hilarious!!!!!!! “It takes absolutely no skill to flood your own half with 9 players and pass across 5-yards until the opposition gets bored”. No skill at all [cannot stop laughing]. This sentence showed that you are not speaking honestly, and that you are simply hating Barcelona for eliminating one of your favourite teams or something similar. Are you a Cockney trying to speak Castilian Spanish? From your description, I don’t think you’ve watched too many Barcelona games. I am not a Barcelona partisan, but to both insult them and suggest that they have no skill is egregious. I defy you to gather 10 of your homeboys and do what they do; after all, you just claimed it “takes no skill”, so you shoudl be able to replicate it against Real Madrid, right? EPL derbies are exciting? Since when? Generally, derbies are fractured, cautious matches which neither side wants to lose, in my experience. Of course, there are exceptions – Arsenal v Spurs this year springs to mind – but they are just that, exceptions to a rule rather than the other way ’round. Arsenal v Spurs is always like that, it’s the best derby in Europe by a country mile. High pace, good technique, both teams attacking and it isn’t mired by the violence and pathetic shenanigans many of the other big derbies are based around. The main reason it has been overlooked is because Arsenal statistically dominated the fixture for a decade, though in truth nearly all of those games were hard fought and fairly close games where the form of either team was irrelevant. People are starting to take notice though now that Spurs are making a better name for themselves in the ties and Arsenal are throwing away points to them. best derby in Europe hahaha another little Englander. Actually it probably has been the most exciting derby in Europe in recent seasons, I’m a Liverpool fan so I don’t think I’m saying that out of any sort of bias. Name another derby fixture that has had as many high scoring games and only ended 0-0 once in the last 10 years. In the three North London derbies of this season alone there have been 16 goals (9 for Arsenal, 7 for Spurs). In comparison there have been five Clásico’s this season (between probably the two most expensive and valuable squads in football history) with a total of 12 goals (9 for Barcelona, 3 for Real Madrid). So that is an average of roughly a goal every 16 minutes and 52.5 seconds in the North London derby and an average of roughly a goal every 40 minutes in El Clásico (remembering the Copa del Rey final lasted 120 minutes); goals aren’t the only indication of the enjoyment of a game but I think I know which one I’d rather watch this season. Just because someone believes that a certain aspect of English football is superior to European football does not necessarily make them ‘another little Englander’. The English league is generally considered to be exciting worldwide, if it wasn’t it wouldn’t be followed globally as much as it is; against that I don’t think your little Englander argument holds water. On the contrary, keeping possesion is one of the most difficult things to do. It requires instant ball control, and spatial awareness of where your team mates are. Moreover, Barcelona do this in opposition’s half majority of the time, and you got to respect that. Whether possesion based game is attractive or not is of course a matter of opinion, and you are perfectly justified to state it. Wrong. Barca use side-ways and backwards passes more than anything. I will admit to being an avid Farca hater, as I am an Arsenal fan and have always felt disrespected by them. HOWEVER, what I am saying here is free of bias. I will never take away from the fact that they are arguably the best team in Europe. Again, however, there seems to be this mystification with their holding of possession. They pass the ball side-ways and backwards for the majority of the game. The true key, and the one thing I truly admire from them, is their pressing game. When they lose the ball, they are instantly trying to win it back as fast as possible. This is where their ridiculous possession stats begin, with their commitment and work-rate and as much as I dislike them (and the calls that go their way whenever they need help) I cannot deny the beauty of their sheer desire. I think that there is some confusion between the terms attractive and entertaining. In my humble opinion Barcelona are clearly a top team in terms of skill and technique; and the stats seem to bear that out (although stats can be made to say many things). You would expect the Barca style of play to produce attractive games, but their opposition needs points so they play a tight defensive game and Barca respond by playing the short passing, possession game. It can be like watching a boa constrictor at work; technically perfect (the goat doesn’t stand a chance), but not very exciting. But given Bolton’s lack of resources and the fact Coyle’s only been there 18 months, it might be fairer to look again in a year’s time to see if the football has got any more attractive. It’s debatable whether he has the players to be able to play that type of football at the moment. Selling Cahill might give him the scope to mould his side more, if he gets the money to spend. He’ll also probably get more for Cahill than he’s worth. Figures of £10m+ strike me as pretty OTT. that is really correct cahill for me isnt not much worth than $5-8mil. there are better choices but since the team as a whole has done lot of good he will get a better price and second that he is english . hope a joe cole doest become of him . the above comment is mine . Agree with that. He’s a good player, but limited. If he wasn’t English/already in the PL we’d be talking about £7m, as it is, if City come sniffing as rumoured, it could end up being a Lescottish fee. With limited funds available the best option is usually to look outside of the UK. The mentioned Demba Ba is a case in point that a cheap player from a midtable club in one of the big continental leagues can do a good job in the Premier League right away, just need to scout properly. Adrian Ramos of Hertha BSC in Germany should easily hit double figures in a full season for example ( would be a little more than Ba’s 3M Euros though ), Lyon will probably try to get rid of some players to rebuild, etc. I don’t know where Coyle wants to go though, so it’s difficult to pick suiting players. I really have no idea how Bolton went from being 5th for what seemed to be like damn near half the season to 14th by the end of it. It just makes no sense to me. They just dropped so many games towards the end of the season. At the end of the day, I think Sturridge came in too late and their strikeforce just left so much to be desired. The use of Klasnic as a supersub turned out to be disastrous. I think Holden’s creativity is key to Bolton. Until I saw him play this fall I never thought much of Holden (as an American for Team USA) but he seems to be able to hold the ball and create space. I think his injury plus a short bench killed Bolton’s top 8 aspirations. Those are extremely leading statements you start the article with to prime the audience, Cox. If the early praise of Bolton is now suspect, because they dropped to 14th, what then will you say about Blackpool who ended up in 19th? That they were boring too? Or Everton who crept up the table to 7th? It’s been a topsy-turvely season; Aston Villa went into the final day at 14th and ended the season in 9th place! The injuries you bring up can adequately explain the loss of form towards the end of the season, no need to rubbing it in that Bolton couldn’t sustain the early standards they set. My expectation on reading the article title was that the supposed conundrum the fans’ reaction to Bolton’s style would lead to reevaluation of the criteria for judging attractiveness. Instead you stick with standards that you admit are subjective and use stats that you admit may be misleading. In basketball there is a recognition that both a fast break offense (spectacular dunks!) and a half-court, “slow-down” offense (intricate movement!) have their own merits. In soccer however the past half-decade has seen the rise in journalism of a standard that privileges “short passing football, an emphasis upon keeping the ball on the floor” above all else. Yet any season ticket holder at Arsenal will readily admit that those their playing style have the been the reason for a number of boorish games this season. Why is it then that “direct” football is now undervalued and used as an appellation for ‘unattractive’ football (ipso facto)? There is still much beauty to be found in a team that doesn’t hog the ball but is always going for the Hollywood-esque pass. Diving headers and bicycle kicks come at the end of a cross not from playing the ball on the ground. Tricky wingers, running past defenders to get to the byline, are still fan favorites, even if that doesn’t count for much in the opta stats. The traditional English style might no longer be the most effective in Europe but the the TV audience keep coming back in droves. Journalists are bored with humdrum of English soccer and prefer the ’sophisticated’ ‘intricate’ passing moves of the foreign sides. Two of those “very good team goals in the early part of the campaign” were only ones picked for The Guardian’s shortlist as the Team Goals of the Season (not to mention Elmander’s effort in the Solo Goals category). Surely that counts for a bit more in evaluating their style? I’m not sure they’re “leading statements”. And even if they were, I’m not sure there would be anything particularly wrong with that. And you can call me Michael, ta. Well, I can’t really help you if you’re going to judge the article on something that it is not. No, I attempt to quality the stats and discuss how meaningful they are. You’re allowed to do that. I could have said “look – these are the stats – it’s true!” but I didn’t. You can use stats to discuss something and then question how meaningful they are – this isn’t an essay attempting to convince you, it’s just a few ideas and stats with a conclusion. Don’t take it too seriously. “In soccer however the past half-decade has seen the rise in journalism of a standard that privileges “short passing football, an emphasis upon keeping the ball on the floor” above all else..”"
Well, yes. I’m not saying that is my view. I’m not saying that view is correct – I said that in the piece. I’m merely attempting to see whether Bolton *do* play the style of football that is deemed ‘attractive’ by this possibly phoney consensus. Again, with the goals – I mentioned them, yes, they count. I said they made the praise somewhat justifiable. Again, you’re kinda just using the qualifications I’ve already outlined as a counter-argument against something I’m not even really arguing. Not to be a pedant, but what you presented were charts, not graphs. In regards to your analysis of the Fair Play league table, it was a bit short. 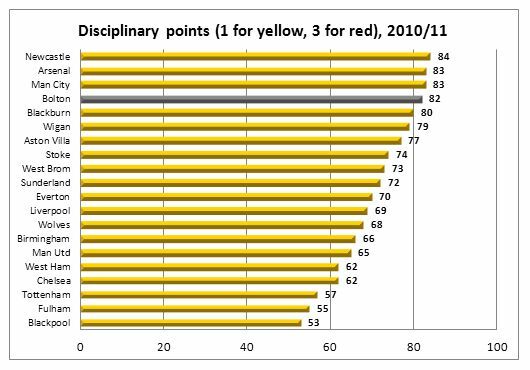 While the table itself shows a decent macro picture of team disclipline, it is clear that some clubs are punished more harshly by referees than others. You mention Arsenal’s position and their 83 Fair Play points, which translates to 2.18 pts per match, as an example. 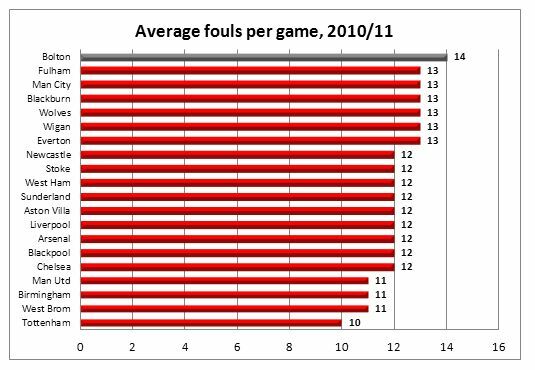 Sticking with Arsenal and factoring in their 12 foul per match average, one can see that they receive 1 point per 5.45 fouls. By comparison, Fulham averaged 1.45 points per match, but averaged 13 fouls translating into 8.97 fouls per point. That is a significant difference and doesn’t even factor in non-calls, which for example has led to the implausible outcome of Rio Ferdinand commiting just 3 fouls in 19 Premier League matches this season and receiving no cards. I understand that this is beyond the scope of your analysis, but it is worth mentioning. And that has nothing to do with referees punishing clubs or any other paranoid delusions, Mr Wenger Arsenal’s cards are completely justified as although they don’t make a lot of fouls, most of them are in situation where the ball is lost, their midfielders are out of position due to Song playing too high up and Wilshere not really being a defensive mid, so they need to intentionally foul in order to stop the possible counter. And those professional fouls are almost always punished by a card, as they should be. super-composed and a greaat foil to vidic. He needs to get rid of Paul Robinson IMO. Embarrassing ogre of a left-back. As a Bolton fan, I agree with you – he’s served us fairly well but is ultimately the weakest player in the first team. Unfortunately, our backup left back may be facing vehicular manslaughter charges and, as far as I can tell, is unlikely to be playing for us anytime soon if ever. Is there a possibility of showing these stastics for mid-season moment? The obvious question that comes to my mind is whether they had excelled in the opposite way in the given statistics back then, and it has been their performance in the second half of the season that brought them to the bottom of the diagrams you’re providing. Analogically to their journey in the points table. I don’t think that this factor is the most importent for attractivnes of football. I think that bayern is better in most of the factors that is used by zonal markinga and they scored even 14 goals more, but still dortmund played more attractive football, and bayern was little booring to watch. Just to add that Bolton had 15 shots per game this season. With the players he has he seems to have little choice. Getting Weiss and Wilshere on loan seems to indicate he may *want* to play more attractive football, but not just now. Are you a Bolton fan hi? if so what have you been watching? All this good football is a myth! Yes we do a few nice passes around the box after we have thumped it up the field time after time. I don’t think iv seen us pass from defence to midfield to attack on more than 10 occasions this season, iv had a season ticket for 20 years and the only time we have played football is the Rioch days, now that is football. Yes we attack but we attack with long ball after long ball hoping it bounces to one of our technical players, ie lee, elmander, sturridge or Mark Davies. While I agree that Barcelona is capable of delivering the best football has to offer, I wholeheartedly disagree with the assessment that attractive football has anything to do with possession. The attractive parts of the game are a direct approach to attacking, with intricate passing, off the ball movement and dribbling. Thats what the fans like seeing: a Messi dribble slalom through the defence, a Xavi majestic ball over the defence, or an intricate combination of passes by Barca offense. Passing sideways and having the cautious approach (which is also an integral part of Barca’s game) is not the part any viewer would label ‘attractive’. That said, I do confess that technique superiority of players translates directly to more entertaining football, and also usually translates directly to greater possession, but it seems a bit of a stretch to say these two consequences of the same root cause are equal. I have to disagree, I enjoy seeing a team patiently hold onto the ball while they wait for an opportunity. I like how it is them getting their breath back after intense pressing(another thing I like watching), tire the opposition about while doing so – I fully subscribe to the opposition can’t score don’t have the ball. It is a thoughtful approach and is an aspect of the game that I enjoy. We all have our own preferences, ‘attractive football’ is a subjective thing. To be fair, part of the reason for all the sideways passes is that teams really do park the bus against Barca–it’s not easy getting behind a defense that puts 11 men behind the ball. Real Madrid chose not to do that in the first game this year and 5-0 was the result–lots of off-the-ball movement and pretty through balls in that one. … Pedro ran a 100m sprint to score his goal — and he still only reached the ball because Casillas took the pace off it! They say that also of beauty, but it is not really true. I also enjoy toughly contested matches of great sides, including patient attacking and defensive discipline, which most casual watchers would quickly label as ‘boring’. I don’t think it is relevant to this discussion though. Patient side- or backpass is still not as attractive as an expertly placed through ball, I don’t thing anyone would argue that it evokes the same level of emotional response. attractive or not is quite debatable just because you make 10 passes doesnt makes it attractive and every time go on on launching the ball up field doesnt makes it unattractive or just physical . at least he did what was necessary and most importantly many a times he got the tactics right also like he the game against chelsea where he pressed them as soon as they lost possession . i think at times they had a higher possession that chelsea and chelsea barely won even at old trafford against united he frustrated them . i think he worked extra on cahill and knight who were woeful last season. the only thing that i would had like more from owen coyle is muamba being moved in the back four in place of davies . muamba has all the characteristics to be a good centre half rather than a midfielder where he seems to struggle but at centre back he can be very good as good as ferdinand as he got the pace and already has the height . hope somebody from the big four teams buy him rather than cahill who is way too overpriced and dull . As far as I’m concerned, Bolton’s attractive football comes from their focus on counter-attack, and the statistics you’ve presented do point to a counter attacking team. 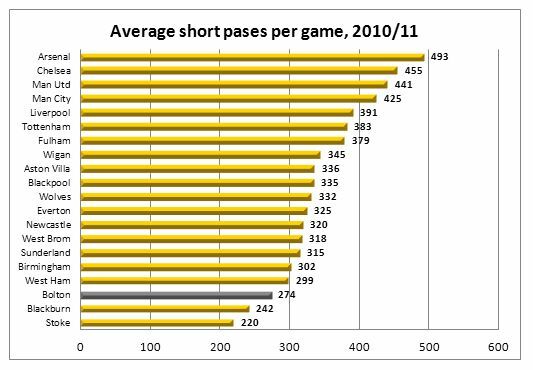 The long balls are vital in getting behind a team that’s pushed up its defence, and the pass completion is lower because of the more speculative passes. Obviously, a team centred around counter-attack is going to be focused on absorbing pressure before launching attacks, so explaining the possession stats. Whether or not its brilliant football is a doubt, but when executed counter-attacking football is definitely entertaining and exciting. Do they really counter-attack though? They certainly play directly, but I wouldn’t have had counter-attacking under their list of strengths. Do you think some of this myth of Bolton playing attractive football under Coyle is based on how dire they were to watch under Megson? you just Completely PWNED Bolton. I watch Bolton home & away and am not surprised by these league tables of each statistic. I think the increased excitement this season has come from the tempo we’ve been playing at rather than build up play, our build up tends to be to quickly get the ball to the wingers (possibly via Kevin Davies’s head!) and work what we can in those areas. Owen Coyle often says that his favourite sight in football apart from a goal is a winger crossing it from the byline. Coyle is a probably tactically naive with his wide open 4-4-2 played both home and away. We’ve been punished away from home with only 2 wins all season, although some of our easier games (e.g. Blackburn, Blackpool, Birmingham) came with little to play for or with cup distractions. The worst away record in the league has been matched up with 10 home wins and lots of late winners at the Reebok – at one point we’d scored 5 goals in 6 games after the 88th minute, and the intricate 2nd goal against Blackpool was unbelievable considering the time on the clock. Worth mentioning that we finished with pretty much a 4-1-5 formation (from memory) in that game and indeed we’ve only ever made one defensive substituition all season – ironically it was to bring on Tamir Cohen against Arsenal. I think we’ve progressed despite a similar league position, but the key is we need the first choice midfield two on the pitch (or maybe Mark Davies) for this team to work. In November we had both strikers and several midfielders playing superbly and that just couldn’t last. Kevin Davies lost form, Lee was in Asia/tired, Elmander was playing in a different position and suddenly towards the end without Holden we became a one man team in Sturridge. With quite a few being shown the door Coyle can finally bring in a few more of his own players, this is still Gary Megson’s squad and he’s only spent a few £million on Alonso & Wheater. Suspect we’ll get good money for Cahill for him to reinvest, starting with up front now Elmander and Sturridge (probably) won’t be here next year. Overall, paying £369 for my season ticket feels like good value in today’s world, so I guess Gartside has got the improvement he was after. 1.46 – Bolton’s average points per game was much higher with @stuholden in the line up – just 0.67 per match without him. Obviously not player can be solely responsible for such a swing but it’s quite a stat. And 1.46 points per game over the course of the season would give us 55.5 points, enough for 7th place, while 0.67 points per game is relegation form. What he said (minus the part about the season ticket, since it wouldn’t really be worth much for me as I live in New York). At our best this season, we’ve been high-tempo and high-energy, neither of which was ever really true under Megson. We’ve also tried to spread the ball wide and play pretty dynamically. Some of these things don’t really come across in stats – I’d be curious if we had a “miles run” stat if that would show what I’m talking about. Also, possession stats were extremely negatively impacted by the loss of Holden (by far our best ball-retaining player) to injury and Lee to the Asian Cup. We’ve also had to play too many players out of position, as you mention, with Elmander playing a lot as a right wing and then a central midfielder. Lastly, it’s worth keeping it simple and looking at goals scored – we’re the 10th highest scorers in the league, and our position would have been a few places higher on that chart before our dire run at the end of the season. As would most of these stats, probably. Yeah, I think you’ll be better off without Cahill – or better off with the money to reinvest, rather. Wheater’s probably a v good replacement. 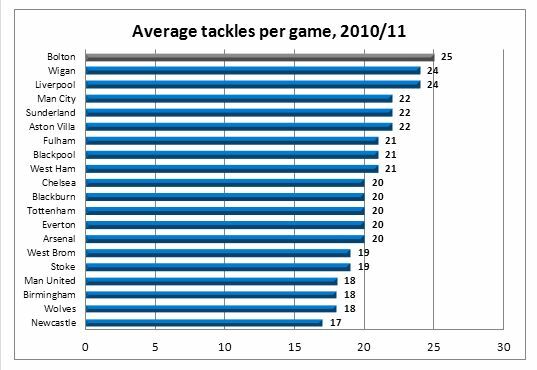 Isn’t the number of tackles a team makes going to depend largely on their possession stats? The more the other team has the ball, the more you will attempt to win it back? Thanks ZM, great read! Those graphs were well done, is there a way to duplicate the graphs, one for 1st half of season another for the 2nd half? I think that might give us more insight to the Bolton without all the injuries (and the free-fall in the table). Given how poor they were towards the end, i think Bolton were one team that wanted the season to end sooner than later. Coyle has done a brilliant job, and lets not forget that this is a transitional period (as he so often says). He has more or less the same team Megson left him with, and isn’t naive to think he can change things over night (unlike the Sammy Lee disaster). This is the same physical side, but Coyle began working on another dimension for us. The Owen Coyle factor owes much to his presence as a man and his ambition to get back into games when we were behind. A breath of fresh air to see him throw two more strikers on when we go down a goal than Megson’s damage limitation theory. It doesnt always work but as a fan it’s a fine thing to see them trying. It’s also notable that Bolton finished only four points (and two places) above their other neighbours Wigan Athletic. In my opinion ‘attractive’ football has nothing to do with tactics but with attacking ‘intent’. Whether you strive for possession or long balls, counter-attacks or patient build up, what matters at the end, to make your game attractive, is how many chances you create, and eventually goals, of course. Perhaps an analysis of the statistics of how many players commit to attacks would provide a correlation to chances created and goals scored. Regardless of the underlining tactics this could show which teams provide more ‘entertainment’. As it’s been said before, the term “attractive” is relative – certainly Bolton have continued to play a somewhat direct style, which they absolutely cannot be blamed for given the unique asset they have available to them in Kevin Davies’ ability to win knockdowns and flick-ons. Aside from that though, there’s no question they’ve played more a more ambitious and attacking style under Coyle than they have under Megson. On its own that doesn’t say much, but the change in mentality (with most of the same players Megson had at his disposal) is both obvious and refreshing. 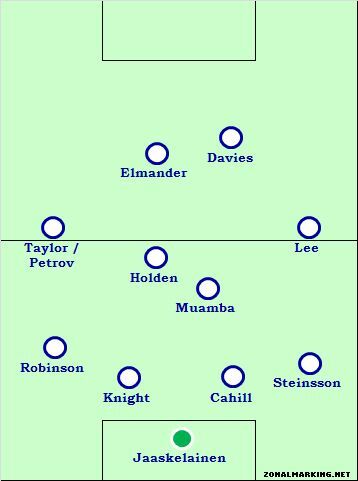 At least half the time under Megson the team lined up in an extremely defensive 4-3-3, with Muamba and McCann holding and either Gardner, Cohen or Mark Davies in front of them. This offered almost nothing from centre midfield in either a creative or attacking sense, and either Kevin Davies or Elmander shifted to the right of midfield with Taylor on the left. It was at times quite horrifying, and that’s speaking from a supporter’s perspective. Once Lee arrived last season he showed more willingness to go 4-4-2, but the bunker mentality was still there, to the point that it seemed like many of the players were afraid to even attempt to pass the ball on the ground. That changed under Coyle, in the sense that he basically just told them go out and play, and set his tactics to try to win every match, however naive it was at times. Players like Knight and Muamba, who are poor passers, were still inclined to knock it long when they found themselves under duress. More players like Holden, Lee, Elmander etc gained that confidence back and started to put together some nice attacking moves, and it created a nice combination with Davies’ aerial play up front. Lee and Holden, for me, were the difference makers when Bolton was playing well, because Holden could keep the ball and pick out a pass when he needed to and Lee felt more comfortable getting forward and making runs through the middle. When Holden and Mark Davies went down, everything fell apart. Muamba’s form tumbled to the point where he lost his spot. 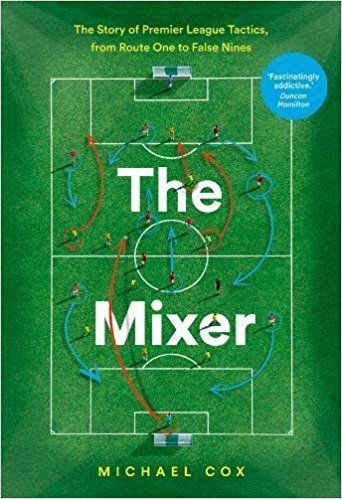 Elmander, Cohen, and Gardner tried their best, but teams started to eat them alive through the middle, and the back four, which had performed above their talent level for most of the season, became exposed. It’s not like Coyle could really do anything about it, either; one might say switch to three in the midfield to protect the back four, but you can’t really even do that if you’ve got no central midfielders to turn to. It’s unfortunate that they weren’t able to get two or three more points, because this deserved to be a top-ten side; it was an incredibly promising season derailed by an amazing lack of squad depth. Certainly the extra cup games didn’t help. Wow, that whoscored.com site you used for the graphs is good ZM! Just checked it out, very interesting site. Great article. I still think Bolton have made progress from the football that they were playing under Megson and Allardyce. Its difficult to play attractive football on a budget. But you can see that Coyle knows the type of players to play that type of football based on who he has signed/got on loan(Holden,Wilshere,Weiss,Petrov,Klasnic,Sturridge). He is the right man for the job and I expect Bolton to finish higher next season. And to add onto the illustration of the importance of Stuart Holden. At the time of Holden’s injury Bolton was in 7th place in the league, headed to their FA cup semi match with Stoke, and tied with ManU in the 75th minute at Old Trafford. Bolton went on to lose the game against ManU despite being up a man, got thrashed in the FA cup 5-0, and lost 5 of the last 7 league games to finish 14th. I think Bolton were playing quite attractive football as long as Stuart Holden played. After his injury, as you mentioned, it seemed like they were going back to a more pragmatic approach. I mean Elmander in central midfield? Seriously? I think Holden would have made a real difference in the semi. Just like to say that since Holden was injured Bolton dropped from 7th to 14th in the league. very very underrated player. Fantastic passing ability, ball retention, is disciplined and has a top work rate. One of the best CM’s in the prem. Gareth Bale won PFA player of the year award, so it’s no big surprise Bolton got glorified after a few games. excellent article. just proves how these media myths just emerge & grow legs. http://sports.my11.com/epl/player_leaders.asp?category=107 as i go on all the time about Pepe Reina 11th best saves ratio in the lge. ! to be fair Bolton were only 3 pt’s off 8th still, but it is a hell of a drop in prize money. Holden was a big loss near the end as many others have commented, combined with the loss of Mark Davies, & poor form of Muamba, who generally has a poor distribution at the best of times. Matt Taylor pass % is often very poor too, hovering around 50%. with Davies & elmander up front, theres also an element of playing to strengths. there’s a massive home /away split too. bolton finished 7th in the home lge, rock bottom 20th in the away table. so i guess home supporters who pay for season tickets will be quite happy with that. i also feel 4-4-2 v 4/3/3 is relevant. Coyle played 4/3/3 at burnley and got better possession. as cruyff says 4-4-2 does’nt lend itself to passing triangles. & coyle has never once tried 4/3/3 at bolton. blackpool proved you can get lesser players to knock it aobut well in the Prem, (playing 4/3/3 ) where you populate the midfield & play shorter passes because your team mates are closer to you to start with ! I honestly think Bolton would have finished in the top half if Holden had stayed healthy. He was one of the best box-to-box midfielders in the league this year. Three points I have to make. 1.Coyle has a reputation for getting his teams playing good football, so seeing as he’s the gaffer, Bolton have fed off his reputation. 2.Compared to how Bolton were under Allardyce/Megson, Bolton are playing decent football. It’s certainly more attacking and ‘better to watch’ than what they were. 3.The media have basically brainwashed everyone into thinking Bolton have become some kind of the second coming of Barcelona, when in fact, despite improvements, they still don’t play great football in my opinion, just better in comparison to the football they previously played. Having watched Bolton a fair bit this season, I also hadn’t bought into the ‘fantastic football’ Bolton were supposedly playing. It’s also the team they play with which makes it hard for them to play good football. With players like Robinson in defence, (decent player, not a great footballer) ditto for Muamba in midfield, and the fact they have two big target men in Davies and Elmander up top means playing football is more difficult. To say that he deserves criticism is a bit harsh, he took over Bolton when they were one of the favorites to go down. He has totally transformed them from a team focusing on staying in the premier league to a team challenging for a top half finish. As for the attractiveness argument, theres no point walking in the Stoke team and demanding they play like Barcelona, as with Bolton there strengths don’t lie in that style. However there has been evidence Coyle has introduced elements of the “attractive” style of football and we’ll probably find it’s something he’ll introduce more over time rather than immediately demanding a change. In my opinion this is the best way to change a teams style as there has been evidence with managers like Hodgson (Liverpool) and Scolari (Chelsea) that trying to change the way a team plays from the start only ends in a dramatic drop in the teams form. As for the final league position, the fact he managed to get a full strength Bolton to the Champions League spots a one point is a remarkable achievement. And you mentioned it yourself that he had a small squad complimented with injury problem which caused the teams drop down the table. I think if he continues to develop the squad sensibly like he has being doing Bolton will see a steady improvement both in the final league positions and also in the “attractiveness” in the way they play. P.S. I’d also like to mention that i don’t find the watching Barcelona keeping the ball for 90 minutes and killing the pace of the game particularly attractive. Watching two teams go at it in an end to end game in my opinion is the pinnacle of attractive football.